Chaz and Chauntal Romero with their almost 10-month-old daughters, Avery, left, and Emma. Emma had blood drawn Thursday to be tested for measles. Orange County received the notice of the negative test results from the state lab at about 11:45 a.m. Friday. 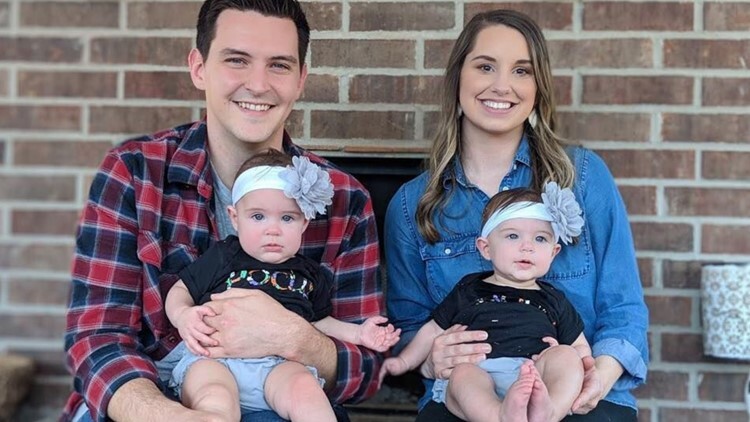 BRIDGE CITY, Texas — A Bridge City couple got the news Friday after a week of waiting that their infant daughter does not have the measles. Test results for 9-month-old Emma Romero came back negative according to her mom, Chauntal Romero. "We’re all super relieved and excited to get back to normal life again," Romero told 12News. Orange County received the notice of the negative test results from the state lab at about 11:45 a.m. Friday according to Orange County Emergency Management Coordinator Joel Ardoin. Romero, made a Facebook post last Friday saying her 9-month-old daughter, Emma, had blood drawn to be tested for measles on Thursday night at Christus St. Elizabeth Hospital.